Sterile. Pheniramine maleate 0.3%. Naphazoline hydrochloride 0.025%. 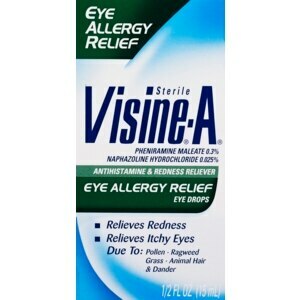 Antihistamine & redness reliever eye drops. Clinically proven to relieve itchy, red, allergy eyes due to pollen, ragweed, grass, animal hair + dander. Made in Belgium. Active Ingredients: Naphazoline Hydrochloride (0.025%), Pheniramine Maleate (0.3%). Inactive Ingredients: Boric Acid and Sodium Borate Buffer System Preserved with Benzalkonium Chloride (0.01%) and Edetate Disodium (0.1%), Sodium Hydroxide and/or Hydrochloric Acid (to Adjust pH), and Purified Water. Adults and Children 6 Years of Age and Over: Put 1 or 2 drops in the affected eye(s) up to four times a day. Children Under 6 Years of Age: Consult a doctor. Some users may experience a brief tingling sensation. Store between 59 and 77 degrees F (15 and 25 degrees C). Do not use if you are sensitive to any ingredient in this product. Ask a doctor before use if you have heart disease; high blood pressure; narrow angle glaucoma; trouble urinating due to an enlarged prostate gland. When using this product pupils may become enlarged temporarily; do not touch tip of container to any surface to avoid contamination; replace cap after each use; remove contact lenses before using; do not use if this solution changes color or becomes cloudy; overuse may cause more eye redness. Stop use and ask a doctor if you feel eye pain; changes in vision occur; redness or irritation of the eye lasts; condition worsens or lasts more than 72 hours. Keep out of reach of children. If swallowed, get medical help or contact a Poison Control Center right away. Accidental swallowing by infants and children may lead to coma and marked reduction in body temperature. Do not use if Visine imprinted neckband on bottle is broken or missing.